Back in May, after the decision by the Ontario Superior Court of Justice in the case of Wiggins et al vs wpd, we wrote to the Mayor of the City of Ottawa to inform him of the importance of the Court’s decision: that it was acceptable for property owners who live as neighbours to property being leased for industrial-scale wind turbines to sue for property value loss and nuisance at the time of approval of a wind power project (i.e., they do not have to wait until the power project is built), and that the Court accepted that property value loss had already occurred simply with the announcement of the power project near Clearview Ontario, on the order of 22-50 percent. The effect of the proposed wind power project in North Gower-Richmond will be significant, we wrote , in terms of the potential danger to health (also acknowledged by the Court) and property value loss, which we estimate to be approximately–and conservatively–$70 million. “Should a wind power developer* seek a renewable energy approval in Ottawa,” he wrote, “the City will review all documentation and information relating to the proposed development and fully participate in any such consultative process. …the City will be in a better position to assess its response…and to address any concerns and needs of the public.” Note he does not say that the City will ensure people are not harmed; he does not say, the City will ensure that its residents are protected. We wrote back–sorry to take up more of his time–and said that we had recently participated in “dialogue” sessions with the province and found that we, along with other stakeholders, believe the renewable power (they keep saying ‘energy’ because it sounds nicer than power plants, but that’s the truth) planning process is deeply flawed and Ontario needs a completely new process. There was NO ONE from the City of Ottawa at the evening session we attended, and as far as we know, NO ONE from the City of Ottawa at the morning session, hosted by the Ontario Power Authority. We told the Mayor that we demanded a return of local land-use planning powers to municipalities (removed by the Green Energy Act) and also a cost-benefit analysis including the impacts, financial and health, on local communities. Many analysts are now describing the province’s “green” energy plan as a monumental policy failure that has already run electricity prices so high it is affecting businesses’ ability to be competitive (let alone survive) and has had an astounding effect on Ontario’s rural and small urban communities. All we ask is that our City protect us from a power plant that is not needed, which uses an invasive, expensive and unreliable technology, and which will doubtless negatively affect this community. 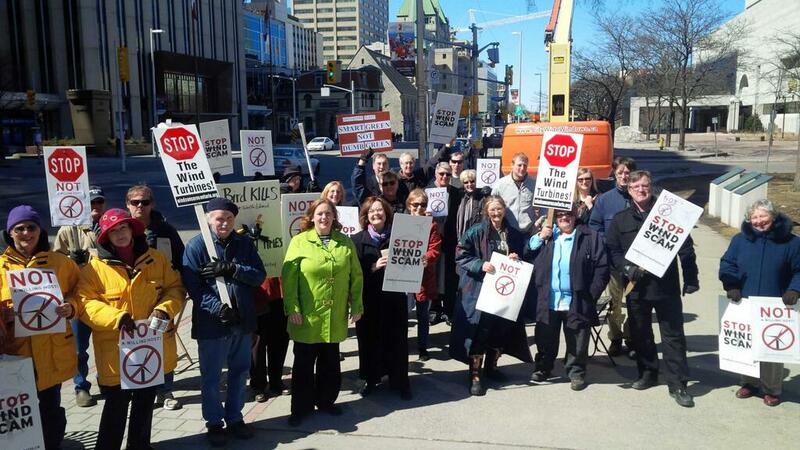 Not a Willing Host demonstration, Ottawa City Hall, April 2013; MPP Lisa MacLeod and community members. *the Marlborough 1 project is on “hold” until the province announces its new procurement process; wind developer Prowind, headquartered in Germany, told the Ottawa Citizen recently that it intends to reapply when the new process is in place.